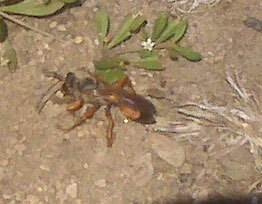 Unfortunately, this is not a cicada killer wasp. While it is a burrowing wasp like a Cicada Killer, this is actually known as a Great Golden Digger wasp Sphex ichneumoneus. These wasps like to prey on Katydids. Thanks for the photo.